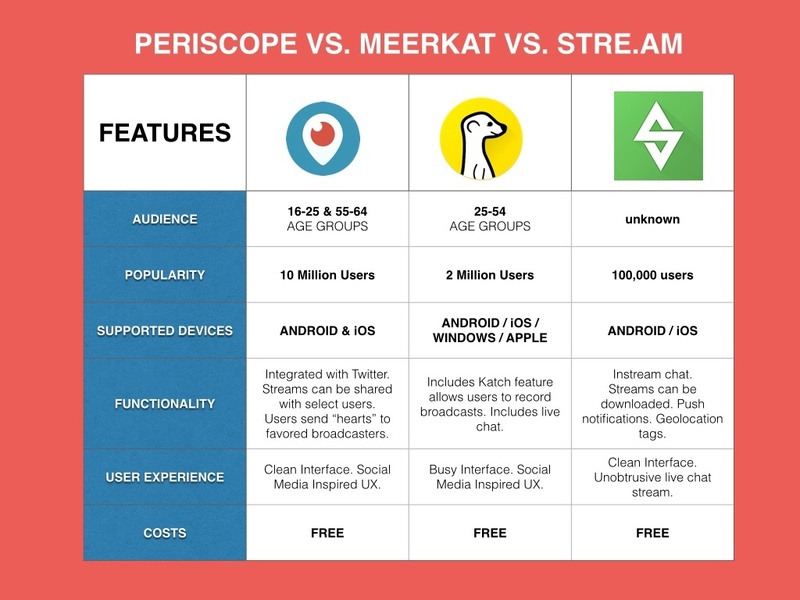 Periscope vs. Meerkat vs. Stre.am: Which Live Streaming App is Best? Live broadcasting is one of the latest and hottest trends in inbound marketing. There are some 10 million users registered to Twitter-owned Periscope, which boasts 2 million viewers streaming over 40 years of video each day. However, if you're wondering how Periscope stacks up to rival apps Meerkat and Stre.am, you're not alone. Inbound marketing pros are forever tasked with the challenge of finding the right platforms. Investing in apps or marketing methods that don't fit your business or target personas' web habits is a waste of resources. At Lean Labs, we're committed to trying new products to see what works across different industries. In this blog, you'll learn some of the pros and cons of live broadcasting, as well as some specifics of Periscope, Meerkat, and Stre.am. You'll emerge with an understanding of which of these apps (if any) is the right fit for your inbound marketing strategy. There have been few content platforms to get as much attention as quickly in recent years as Periscope, Meerkat, and other live broadcasting apps. Since these two newcomers launched in February and March of this year, there have been over half a billion posts and 5 billion impressions collectively. There's even been a rise of live broadcast power users, who use the apps daily and gain upwards of 10,000 followers in the process. Forever an early adopter of colorful and entertaining video content, Redbull recently used Periscope, Twitter, and Snapchat to promote a Miami Music Week event. General Electric appealed to it's audience of tech geeks with a "behind the scenes" interview with Bill Nye the Science Guy and Neil deGrasse Tyson. Adidas live streamed pro soccer player James Rodriguez signing a renewal of his endorsement deal with the sportswear brand. The potential applications of live streaming aren't limited to the sports or music industries, as was showcased by General Electric. In fact, Entrepreneur's Samuel Edwards writes that there is "no other technology" with a potential for such significant impact on how consumers consume content. Periscope was purchased by social media giant Twitter in March and gained over a million users in the first days following it's launch. It's functionality is pretty simple and easy to adopt. Users simply create a live stream from an internet-enabled mobile device. However, it's connection with Twitter is unique. Social media followers receive automatic access to a link directly to the live stream. While the app currently has 10 million registered users on both Android and Apple devices, some 2 million users log in and stream over 350,000 hours of video on a daily basis. Currently, less than 30% of Periscope users are female. Early demographic assessments of streaming app users indicate Periscope has the edge among users ages 16-24, and 55-64 though adoption is higher among younger users. While the app is technically free, sponsored Periscope streams have been available to brands since June. However, numerous brands have had success at attracting an audience without paying to promote their feeds. According to tech writer Xavier Harding, Periscope has the edge above virtually any other streaming app when it comes to user experience. Harding praised the fact it appears "polished and better thought out" than many counterparts. The unique ability to share streams selectively with particular users is another key benefit of this platform, allowing brands the possibility of making special announcements to key customers or prospects. Meerkat was among the first video streaming apps, and it took tech conference SXSW by storm. While it's popularity lags behind rival Periscope, and it has no connection to any major social media network, it's every bit as easy to adopt as Periscope. Currently, all streaming functionality performed via this app is free for users and viewers. Additionally, Meerkat recently announced new GoPro functionality for users who connect a GoPro 3 camera to an Apple device. The service intends to extend this benefit to Android and GoPro 4 users in the near future. Researchers report there are currently 2 million registered users of Meerkat. While data was unavailable to report how many of these users log in daily, 20% consume over 2 hours of video content each day. Meerkat is the most widely adopted app among users between the ages of 25-54, with audience members between 35-44 most likely to select it instead of Periscope. Harding isn't the first or last user to describe Meerkat's interface as "cluttered." While it's not nearly as clean-looking as Periscope, it's interface is still attractive and highly intuitive for users of nearly any age. Key, unique functionalities include the "Katch" feature, which permits users to save streams. Additionally, Meerkat permits viewing on desktop devices, which expands its potential audience. While Periscope and Meerkat are by far the most widely discussed options for live broadcasting apps, they're not the only ones. One less-known, but viable, option for marketers is Stre.am. While it lags in popularity behind rival apps, Stre.am CEO Eric Bowman shared in a VentureBeat interview that he believes his offering has key differentiations and unique features. Stre.am is also free for users, and does not currently have any sponsored content options. While information on Stre.am's user base, user demographics, and related factors has not been publicly disclosed by the app's team, Google Play reports there have been between 50,000 and 100,000 downloads of this app to Android devices alone. Out of all three apps reviewed, Ste.am's interface is the cleanest and most user-friendly. It offers the unique ability for users to participate in a non-obtrusive live chat session during live streaming sessions, which is conveniently displayed on the left side of the stream. Users can download video files to their device, or view for 24 hours after the broadcast concludes. Finally, privacy is a huge focus of this app. Users can view streams anonymously, and safety-conscious broadcasters have the ability to remove geolocation tags from their streams. Live broadcasting via these exciting new app offerings has the potential for brands to build intimate relationships with their audiences. Much like Snapchat marketing, communicating with prospects and customers via live streaming carries an element of exclusivity and mystery. Humans love the potential for a surprise or access to exciting new information. Giving your audience a behind-the-scenes look, access to an exclusive interview with thought leaders or other great streams can help you build loyalty and engagement. Picking the right platform is key, and an understanding of your ideal buyer demographics can help you select which choice is right for you. If your customers are younger or heavy Twitter users, Periscope may edge out Meerkat. If they're less likely to use smartphones during work hours, Meerkat's desktop functionality could be a key consideration. Some brands by-step the need to choose entirely and stream via two or more apps simultaneously to capture the greatest audience possible. One thing is abundantly clear, however, which is that live broadcasting probably isn't a fleeting trend. The explosive popularity of these new apps indicates it's likely to continue as a popular mode of communication between brands and customers. In fact, because live broadcast app users are a highly engaged audience, Meerkat, Stre.am, Periscope and other apps could even become a powerful tool for customer acquisition and reaching new audiences. Are you using Meerkat, Periscope, or another live broadcasting app for inbound marketing? Why or why not?